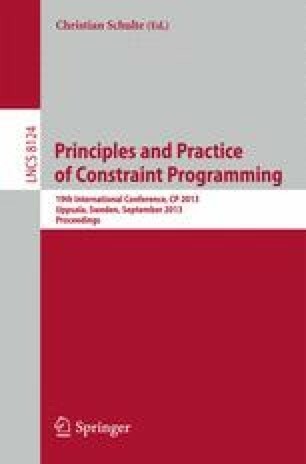 We propose the Embarrassingly Parallel Search, a simple and efficient method for solving constraint programming problems in parallel. We split the initial problem into a huge number of independent subproblems and solve them with available workers, for instance cores of machines. The decomposition into subproblems is computed by selecting a subset of variables and by enumerating the combinations of values of these variables that are not detected inconsistent by the propagation mechanism of a CP Solver. The experiments on satisfaction problems and optimization problems suggest that generating between thirty and one hundred subproblems per worker leads to a good scalability. We show that our method is quite competitive with the work stealing approach and able to solve some classical problems at the maximum capacity of the multi-core machines. Thanks to it, a user can parallelize the resolution of its problem without modifying the solver or writing any parallel source code and can easily replay the resolution of a problem. This work was partially supported by the Agence Nationale de la Recherche (Aeolus ANR-2010-SEGI-013-01 and Vacsim ANR-11-INSE-004) and OSEO (Pajero).